(left to right) Jerry Gilbert, Pres. of Marshall; Gordon Gee, Pres. of WVU; Kendra Boggess, Pres. of Concord; Michael Farrell, Commissioner with the WV Higher Education Policy Commission; and Gov. Jim Justice. During a press conference on July 2, 2018. 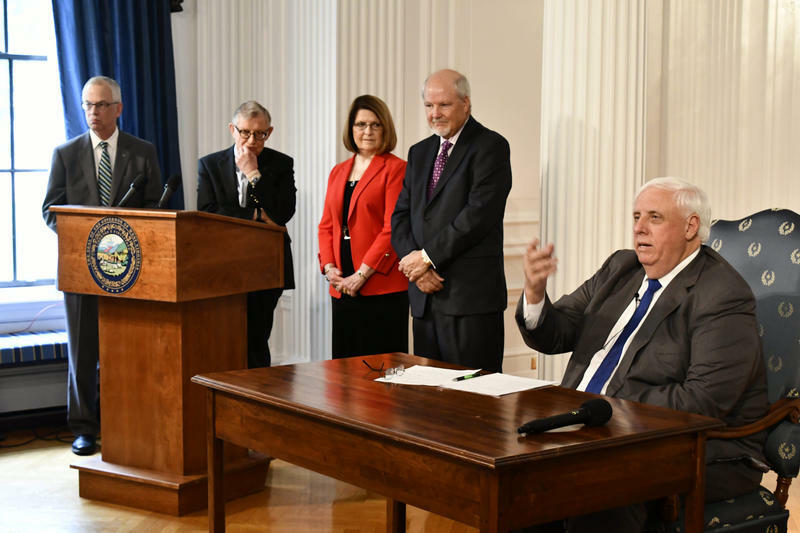 He said tax revenues were up across the board this past fiscal year, including both income and coal severance taxes. Justice also noted companies are doing well and generating increased income for the state. He also said construction jobs had increased significantly. Following the revenue update, the conversation shifted onto higher education. Justice announced the creation of the Blue Ribbon Commission on Four-Year Higher Education – intended to study all of the state’s four-year institutions and figure out what’s working and what’s not. The commission will review things like redundant programs, and look at how to help the schools thrive in the most efficient way. Co-chairs on the commission are Gordon Gee; President of West Virginia University, Kendra Boggess; President of Concord University, and Jerry Gilbert, President of Marshall University.